• For quantitative determination of ascorbate (ascorbic acid) and evaluation of drug effects on ascorbic acid metabolism. • Use 20 μL samples. Linear detection range: colorimetric assay 6 to 1000 μM, fluorimetric assay 1 to 100 μM ascorbic acid. • Ascorbic acid (the L-enantiomer commonly known as vitamin C) is an important antioxidant found in living organisms and applied as additives in food and other industrial processes. By reacting with reactive oxygen species, it protects the cell from oxidative damages. BioAssay Systems method provides a simple, direct and high-throughput assay for measuring ascorbic acid. In this assay, ascorbic acid is oxidized by ascorbate oxidase resulting in the production of H2O2 which reacts with a specific dye to form a pink colored product. The color intensity at 570nm or fluorescence intensity (530/585 nm) is directly proportional to the ascorbic acid concentration in the sample. 1. 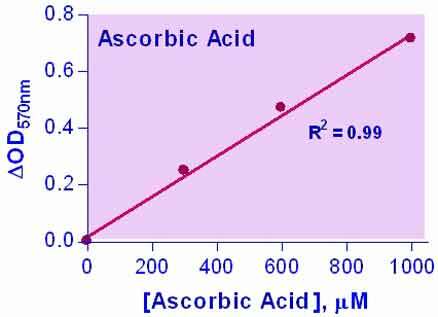 We would like to measure ascorbic acid in liver homogenates, which are in 0.25M Sucrose. We want to confirm the sucrose will interfere with the assay? We have not tested the compatibility of sucrose with this assay. Based on the mechanism of the assay we see no reason why sucrose would interfere and believe the assay will work just fine. 1. Trezzi, JP et al (2016). LacaScore: a novel plasma sample quality control tool based on ascorbic acid and lactic acid levels. Metabolomics 12: 96. Assay: Plasma in Humans (Pubmed).